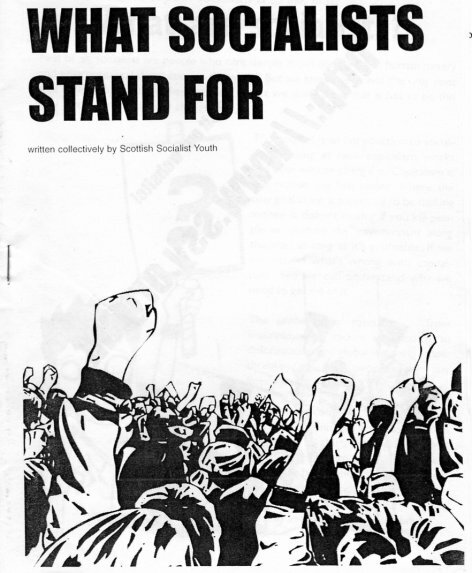 The Scottish Socialist Youth (SSY) have put together the pamphlet What Socialists Stand For , adapted from a similar pamphlet published by the Democratic Socialist Perspective in Australia, to serve as an introduction to socialist politics. The idea is a very good one; a pamphlet-length exposition of the socialist position provides exactly the right sort of introduction to potential readers, particularly young people, who may be interested in changing the world but are not yet aware of socialist ideas and perspectives on the world. The pamphlet is written in plain language with minimal jargon throughout. When writing material of this sort, there is always a tightrope to walk between oversimplifying our ideas – or worse, coming over as patronising – and writing in a way that will mystify (or simply bore) the casual reader. Anyone who has ever listened to the frequent debates in SSY around the style of the writing in our magazine Leftfield will know that the SSY often has to approach this problem. The SSY’s publication of a simplified, modernised version of Lenin’s The State was an excellent example of getting this balance right; and What Socialists Stand For also hits the right note in its language. The good political health of the SSY is reflected in the pamphlet’s contents, which are generally excellent. The pamphlet functions in the same way as an abridged version of Alan McCombes’s Imagine ; but unlike Imagine , What Socialists Stand For puts forward a consistently revolutionary stance, with no illusions in the power of parliaments to change our world. I don’t intend to summarise the whole pamphlet – you should buy it for that! – but I’ll take a trip through some particular highlights below. After a brief introduction, the pamphlet opens with a discussion of the environment. As green issues are one of the areas which most frequently radicalise politically interested youth, this is a good place to start; and the pamphlet explicitly links the destruction of the environment and wasteful over-production with the capitalist system and its need to create markets for its products, and the need to turn a profit being considered more important than the long-term future of humanity. In a section entitled Making poverty history? , the hypocrisy of first world governments and liberal/reformist illusions in the willingness of first world governments to end poverty throughout the world are attacked. However, importantly, the notion of imperialism is also briefly but pertinently presented. For those who are disillusioned with the failure of first world governments to address global poverty, it is important to point out that the system actually requires that this be so, and that other solutions are required. The section on unemployment addresses why capitalism needs unemployment to function and focuses on the growth of McJobs and casual/precarious labour, as well as the particularly strong alienation that comes along with these; again very pertinent issues for young people. The following section develops the idea of the socialisation of production over history and very clearly explains the socialist conception of class. The explanation of bourgeois democracy – the Democratic Show , as the pamphlet refers to it – and the function of the state in capitalist society, which could have drifted into very abstract theoretical writing, instead remains pointed and clear throughout, without either oversimplifying the ideas or accommodating illusions in bourgeois politics. The section on Scottish independence focuses on the republican and anti-imperialist aspects of breaking up the UK state, rather than relying on arguments about the supposedly further left-wing political centre of gravity in Scotland. The SSY is proud of its principled feminist politics, so it is no surprise that the section on How capitalism oppresses women is particularly well-written, with a clear explanation on why capitalism actively encourages sexist ideas; this then develops into a discussion of the role of the family in capitalist society with an emphasis on LGBT oppression. The last third of the pamphlet is dedicated to a view of the socialist alternative. It does not go into heavy details about a potential socialist system, although there are some brief suggestions about what a socialist democracy and planned economy might (not definitely will) look like in practice; but on the issue of how we get from here to there it presents a revolutionary perspective, drawing on examples such as the events of May 1968 in France to demonstrate our conception of people’s power. The pamphlet also emphasises the need for socialists and working people to organise to achieve this, consistently and persistently, whether we’re going through good times or bad; and the fact that such a revolution cannot be held in Scotland alone (and survive), but must challenge capitalism on a global level. The highlights of the pamphlet certainly comprise the majority of it; but there are a couple of points where the pamphlet could perhaps have been sharper. For example, although the discussion of casual labour explicitly makes the point that precarious working practices make it difficult to organise workers in these industries, the suggestion offered is essentially simply that young workers should join a union. Now although any emphasis on organising young workers is welcome, the pamphlet has perhaps missed an opportunity to point out that, in a situation where workers are changing job and workplace very frequently, structures other than the traditional trade union will be required in order to organise. It is also curious that, despite the fact that the pamphlet in general does not uncritically accept the existing order in any other area, the role of trade union bureaucrats in stifling or managing genuine rank-and-file action escapes criticism in this section. Also, the section on racism is good as far as it goes, but does not include the principled socialist attitude towards immigration controls – i.e. total opposition. 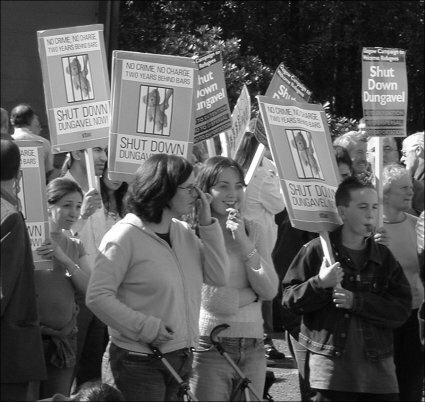 It also uses the argument that Scotland, with a shrinking population, needs workers to immigrate – true enough, and it is important to counter the swamped by immigrants standard media line, but as the No One Is Illegal campaign points out, we need to point out that we are against controls under any circumstances, not just when it would be economically beneficial for our nation-state. Knowing the SSY’s politics, I suspect that this is an oversight rather than a real political fault, but it is an important point all the same. However these are very small quibbles when put in the context of the whole pamphlet, which consistently hits all the right notes both politically and stylistically. It will be a very useful tool for the SSY and it will be a good read for new activists – and any non-youth comrades interested to know about the SSY’s political thinking should buy it too!